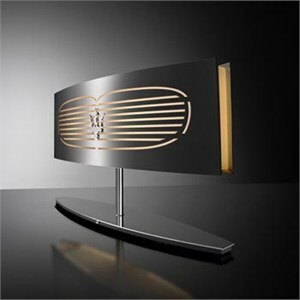 Lumina and Maserati have come together to give birth to the Maserati Lamp, a shining jewel, with great attention paid to every detail in the best "Made in Italy" tradition of quality craftsmanship. They have given their all to create a product that has elegance, excellence and meaning. An exciting combination of design and technology. The steel, laser-cut shades, contain a luminous heart that glows through the opaline glass. The design of the lamp revives the original lines of the Maserati front grille. The trident acts as the on/off switch as well as the touch dimmer. Polished chrome plated steel, with polished opaline glass and white polycarbonate diffusers. Dimensions 24"L X 6"W X 14.5"H. Uses 2 X 60W 120V E26 (medium base) incandescent or halogen lamps (not included). These items are final sale, returns will not be accepted. Prices are effective while supplies last.